History teaches us it’s a good thing to have teeth. We live in an age when many people have access to dental care and strong, bright smiles. We’re fortunate that we can visit trained professionals with state-of-the-art technology to keep our teeth healthy. In fact, three out of four Canadians visit their dentist at least once a year. We’ve come a long way since the early days of dentistry. Sunnyside Dental’s historian has compiled a brief history of our profession. Have a look; some of these historical stories are sure to put a (healthy!) smile on your face! Archaeologists and historians working in the Indus Valley (what is now Pakistan) have found evidence of early dental healthcare dating back to around 7000 BCE. They’ve excavated skeletons with precisely drilled holes in their teeth. The fact that those teeth were discovered still in their jawbones indicates that this historical method of removing decay was successful. For thousands of years, people assumed that cavities and tooth decay were caused by “tooth worms”. The oldest mention of these comes from an ancient Mesopotamian text dating to around 5000 BCE, but this theory persisted well into the 18th century. People have used different tools throughout history as “toothbrushes.” These toothbrushes include sticks, bird feathers, and porcupine quills! Dentistry advanced significantly in ancient Egypt. Mummies with fillings and crowns made of various materials (like resin and stone) have been discovered there. It’s also where the first dentist, Hesy-Re, lived, in around 2600 BCE. Not surprisingly, the Egyptians are credited with developing a rudimentary form of toothpaste nearly 5,000 years ago! By around 700 BCE, dentistry was a common practice. The ancient Greeks and Etruscans all developed technology specific to dental surgery, like extraction tools and bridges made of gold wire and carved animal teeth. Ancient Romans were believed to use a toothpaste made from honey and eggshells. In the 1400s, the Chinese invented a toothbrush made from bamboo and pig bristles, very similar to our modern toothbrush. Around the same time, the Barber Surgeon Guild emerged across Europe. 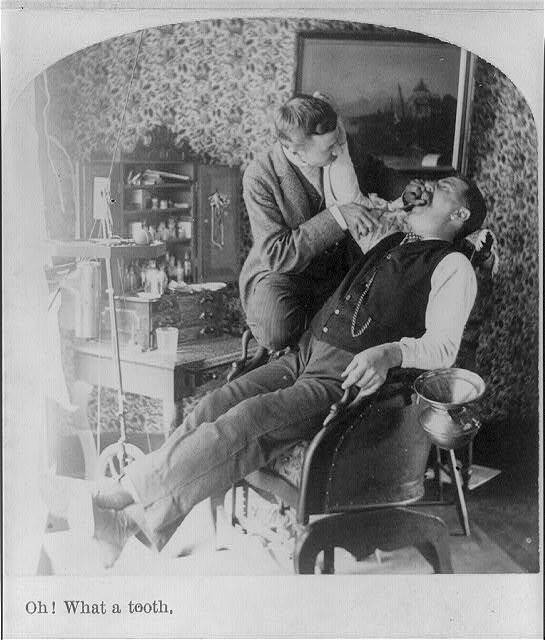 A visit to the barber could result in a shave, a haircut, a bleeding by leeches, or a tooth-pulling! These historical dentists also developed advances in restorative dentistry that lasted for hundreds of years. False teeth made from bone, ivory, and even other human teeth were common. In 1728, Pierre Fauchard published a scientific text about dental treatments and became known as the Father of Modern Dentistry. In the Age of Enlightenment, dentistry became a recognized profession. New dental materials and discoveries allowed for more hygienic practices. Porcelain dentures also became standard (no more using the teeth of the recently deceased!). Around this time, universities began to open specialized dental schools. Also, a visit to the dentist was made easier with the adoption of nitrous oxide (laughing gas) as an anesthetic. “Dental Creams” (toothpaste) became available to the general public. The invention of the impression compound and other applications of synthetics like rubber denture bases ushered the profession into the 20th century. In the 1930s, modern toothbrushes with nylon bristles (not the historical pig’s hair!) and more effective, better-tasting toothpastes were standard. New research about bacteria meant that the average citizen knew the importance of a healthy mouth. With advances in general medicine, radiology, and surgery, modern dentistry made rapid progress. Right now is the best time in history to ‘have to visit’ a dentist! With today’s incredible technology, most treatments are painless and quick. At Sunnyside Dental, we use the most up-to-date technology, such as our iTero scanner. We also use modern materials, including zirconia and ceramic, for implants. We provide secure and easy bridgework, Invisalign®, teeth whitening and more. And, of course, everyone is grateful for modern anesthesia! We provide exceptional dental services, whether you’re in for a checkup, a restoration, or a cosmetic treatment. In a nod to the Barber Surgeons of old, we even provide a variety of cosmetic and medical Botox treatments at our clinic –but you’ll have to go somewhere else for a haircut! Sunnyside’s professional team of dentists, hygienists, and dental assistants have the knowledge, experience, and friendly temperaments to make any stay in our chair a pleasant one. Contact us to see how we can address your oral healthcare concerns.